Michel Platini will be paid his salary by Uefa "until further notice" despite having been banned from football-related activity for eight years, the European governing body has revealed. The confirmation comes after it was revealed that outgoing Fifa president Sepp Blatter, who has also been banned, will receive his Fifa salary until the election of his successor on February 26. 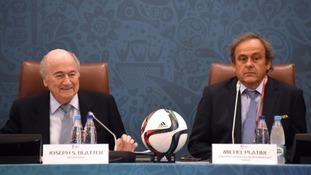 Uefa said it would not disclose suspended president Platini's salary, nor that of general secretary Gianni Infantino. A Uefa statement said: "Mr Platini is receiving a salary from Uefa, and will continue to do so until further notice. Individual salaries are of a confidential nature and therefore are not disclosed." Platini and Blatter were banned for eight years last month by Fifa's ethics committee over a £1.3million payment made to the Frenchman in 2011 - he and Blatter said it was to settle an oral agreement made nearly 13 years previously when he worked as Fifa's technical advisor. UEFA president Michel Platini looks set to avoid punishment for attending a football awards ceremony in Dubai even though he is banned from "all activity" within the sport. Last week Platini was barred from football for eight years after being found guilty of receiving an improper payment of two million Swiss Francs (£1.36million) from FIFA president Sepp Blatter, who received the same punishment. Both men are appealing the decision. In the meantime, Platini has been pictured attending the Globe Soccer Awards by the Dubai Sports Council. When asked about the Frenchman's appearance at the awards ceremony, FIFA said its disciplinary committee was "monitoring the situation", but would not intervene "for the time being". Michel Platini will be able to attend Euro 2016 matches in France next summer despite his Fifa ban - but only if he buys a ticket as a fan. Michel Platini has said he will appeal the decision taken by Fifa to ban him for eight years. The head of European football said in a statement that he will appeal to the Court of Arbitration for Sport against his ban from the game announced by the Fifa ethics committee on Monday. The Frenchman said in a statement that he was "at peace with my conscience". Outgoing Fifa president Sepp Blatter vowed to "fight" his own ban from the Ethics Committee. Uefa will support president Michel Platini through an appeal against his eight-year ban, the organisation has said. In a statement, the body - which represents football associations across Europe - said it was "disappointed" with the decision by Fifa's Ethics Committee to ban and fine Mr Platini. Uefa has taken note of the decision of the Fifa Ethics Committee to suspend Michel Platini for eight years from all football-related activities. Naturally, Uefa is extremely disappointed with this decision, which nevertheless is subject to appeal. Once again, Uefa supports Michel Platini's right to a due process and the opportunity to clear his name. Outgoing Fifa president Sepp Blatter has vowed to "fight" after being hit with an eight-year ban from football. "Suspended for eight years - suspended for what?" he demanded, speaking at a press conference in Zurich following the decision of the Independent Ethics Committee. He confirmed he plans to take his objections to Fifa's appeals body, go before the Lausanne-based sports arbitration panel, or take legal action under Swiss law if needed. He said he had served with "heart and conscience" for more than 40 years, and criticised the committee for its handling of the investigation, saying he felt he had been "betrayed". "I am a man of principles, and these principles are: Never take money you have not earned; secondly, pay your debts - but now they are telling me that I tried to buy votes through Michel Platini votes for the 2011 elections," he added. Outgoing Fifa president Sepp Blatter has said he is being treated as a "punching ball", after being banned from all football-related activities for eight years. "To say that it's a good day for me or for Fifa would be totally wrong," he said. He defended a £1.3 million payment he made to Uefa president Michel Platini, saying it had been part of an oral contract - or "gentleman's agreement" - for his work for Fifa. He accused the Ethics Committee of ignoring evidence of the agreement. "I'm sorry that I'm still a punching ball - and I'm sorry for football," he said. Blatter: I'm really sorry, I'm sorry that I'm still a punching ball. I'm sorry for football.... but I'm sorry about me. How I'm treated .. Outgoing Fifa president Sepp Blatter has arrived at a press conference after being slapped with an eight-year ban by the footballing body's ethics committee. Sporting a plaster on his face, Mr Blatter refused to answer questions from the crowd of journalists as he made his way into the building in Zurich. Sepp Blatter and Michel Platini have been banned from all football-related activities around the world for eight years, Fifa has announced.